VIENTIANE, Laos — Barack Obama on Monday became the first sitting U.S. president to step foot in the isolated Southeast Asian nation of Laos, opening a three-day visit meant to rebuild trust and close a dark chapter in the shared history between the two countries. U.S. President Barack Obama walks down the steps from Air Force One upon his arrival at Wattay International Airport in Vientiane, Laos, Monday, Sep 5, 2016. Photo Credit: Gemunu Amarasinghe/Associated Press. 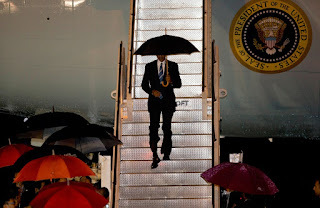 Under a steady, tropical rain, Obama arrived late Monday and began a full day of ceremony and diplomacy Tuesday morning with a meeting with Laotian President Bounnhang Vorachit. The president was greeted by a military band and a display of the troops at the presidential palace. In the 1960s and 1970s, the U.S. rained bombs on Laotian villages and the countryside as America's war with Vietnam spilled across the border. The Laotian government estimates that more than 2 million tons of ordnance were released during more than 500,000 missions â€” one bomb every eight minutes for nine years. In his meeting with Vorachit, Obama quickly acknowledged the "challenging history." He is expected to announce additional aid to clean up unexploded ordnance, while the Laotian government is expected to offer help in accounting for missing and dead U.S. service members. In both countries, Obama benefits from not carrying baggage that might have complicated his message. Too young to have served in the Vietnam war, Obama serves as a generational page turner eager to speak directly to those too young to remember the troubled past. Though Vorachit is seen as edging closer to Vietnam than to China, the country has managed a diplomatic two-step this year. As chair of the Southeast Asian nations' group, it has projected neutrality in other countries' disputes with China over the South China Sea.